Proto Polynesian: *Mako	Trichospermum richii and other trees with similar appearance or characteristics. 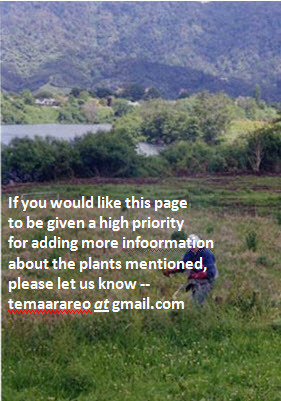 Tongan: Mako (Melochia aristata, Steruliaceae). Samoan: Ma'o (Melochia aristata, M. odorata, & Commersonia bartramia, Steruliaceae & Trichospermum richii (Tiliaceae). 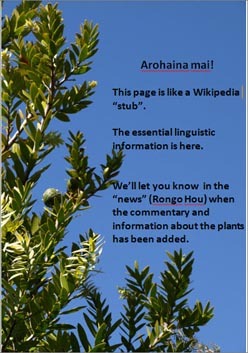 The makomako is a small, bushy tree growing to about 10m high, found throughout New Zealand. It is one of the first trees to reappear in regenerating forest. Its bunches of dark, currant-sized berries yield a luscious juice, which was much esteemed by Māori and new settlers alike; it's English alternative name, "wineberry" relates to one of the uses made of the juice by nineteenth century European settlers. The serrated leaves are conspicuously veined on the undersides, which also often have a reddish blush. Photographs: Yet to come! .